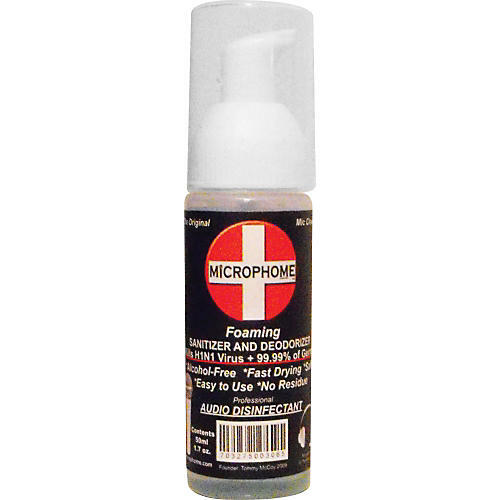 Microphome is a safe and easy-to-use disinfectant/deodorizer for microphones. Available in individual 50 ml bottles, this unique, fast-drying cleaning foam takes only two minutes to use and kills 99.9% of all germs. Microphome is perfect for every performer, venue, and sound company that cares about the health, safety, and sanitary condition of their microphones. Recording studios, rehearsal halls, karaoke clubs, churches, broadcasters and dispatchers alike will also benefit. Microphome comes in a handy 50 ml bottle, which is enough for over 100 applications. The secret to its effectiveness lies in its alcohol-free formula and foam aeration system. The antimicrobial cleaning fluid is pumped in a measured dose of gently aerated foam that clings to the external microphone surface, never touching the internal electronics, then it completely dissipates within two minutes. Founder and CEO Tommy McCoy explains: "In my years as a musician, I've had to use a lot of mics that-well, who knows what might be living on there from the previous users? And there was no product on the market to address it. That's what inspired me to develop Microphome: to help artists protect themselves and others. It helps keep the artists healthy and makes the mics safe to share. It's also easy to use, so it can be part of your routine maintenance. No more nasty mics!" Using Microphome is simple. Just squirt one dose of the foam onto a lint-free cloth or the palm of your hand and rub it onto the microphone's grille. After about two minutes, the fast-drying foam simply evaporates, leaving the mic disinfected, deodorized, and safe so the artist can sing with confidence. Order a bottle today and protect your voice and your band's health by disinfecting your mic the easy way.